I wanted the message to reach as many people as it can. I hope consumers will stop and think about what exactly is happening. 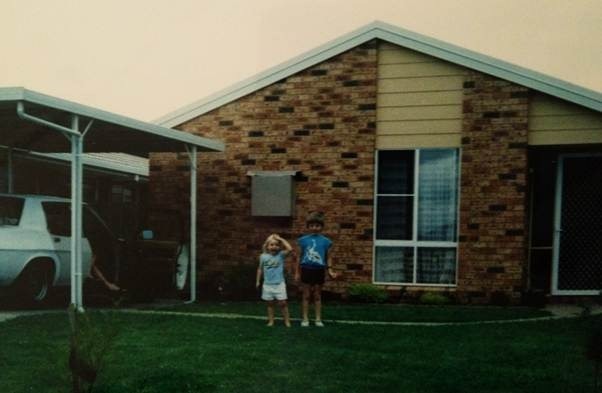 I grew up in suburbia on the South Coast of NSW, born to a chef and a TAFE teacher/mechanic. We lived a typical ‘city’ life, small house, small backyard; no real exposure to agriculture. Except for the odd trip to a family friend’s farm where I was too mesmerised by the Clydesdale horses to notice if anything else was going on. We rode our pushbikes until the street lights came on, and we were warned about stranger danger. We had one tree on our block. The closest thing I came to agriculture was gawking out the window on our many trips to see family in Bungendore. And still, the cattle were too far away to really see anything! I developed a fascination with animals at a young age, especially livestock, however this was completely unlived. I was lucky enough to be given a pony at this stage- which was the closest chance I had of getting up close with a large four-legged animal. Except at ANZAC day parades where mum would threaten to leave me homeless (jokingly of course) if I didn’t leave the Lighthorsemen alone, after standing staring at them all day, when it was time to go home. In 1999, a massive family move to the Snowy Mountains when I was ten saw the start of the the change in my life, most significantly moving closer to the opportunity to be exposed to agriculture. I still couldn’t quite get my hands on it, but we were a step closer, living on a 15 acre block, astride my trusty little Welsh Mountain Pony, staring at the neighbours Herefords over the fence. The galahs and cockatoos would entertain us at breakfast time, and I loved for the first time in my life not having next door neighbours breathing down your neck. I was hooked on that ‘country’ thing! The fresh air, the space, the freedom. Walking down the driveway took no more than 2 seconds to catch the school bus, and mum would let us play in the paddocks all afternoon after school. My longing to return to the place where we grew up was quickly forgotten and replaced with the knowledge that the country was where I wanted to call home. Although, changing from a school of 800 students to one of 300 certainly came as a shock!! The final push came when I went off to boarding school at age eleven. 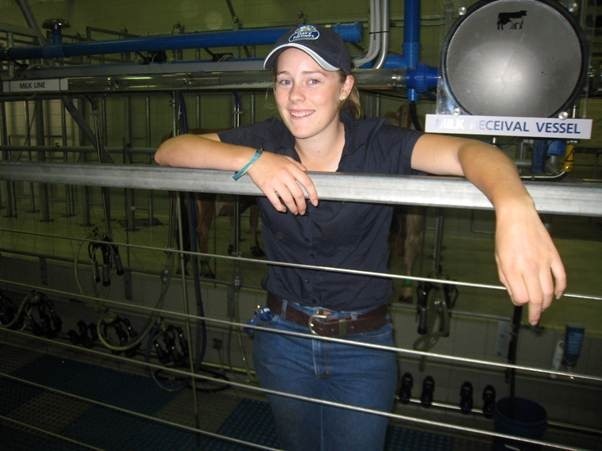 After hearing about an agricultural high school when in year six, I decided I wanted to go there to learn about farming so I could become a vet. On my first day there I was eager to sign up to the Rural Youth Club and enrol in the calf rearing program. 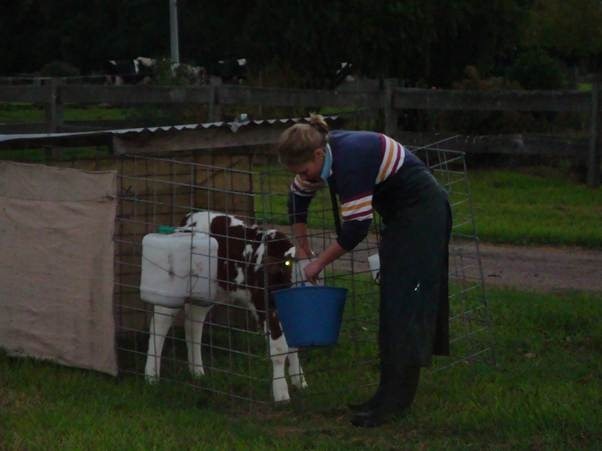 I got to look after my first show heifer, an Ayrshire named ‘Agapantha’. I spent months teaching her how to lead and tie up, spending all my spare hours on the school farm. From memory, some of the teachers were concerned that this behaviour was abnormal and antisocial. How wrong they were! If only they can see where this has got me to now. At the end of that year I attended my first show, a calf show at the school- I was hooked! I didn’t miss a show from then on. 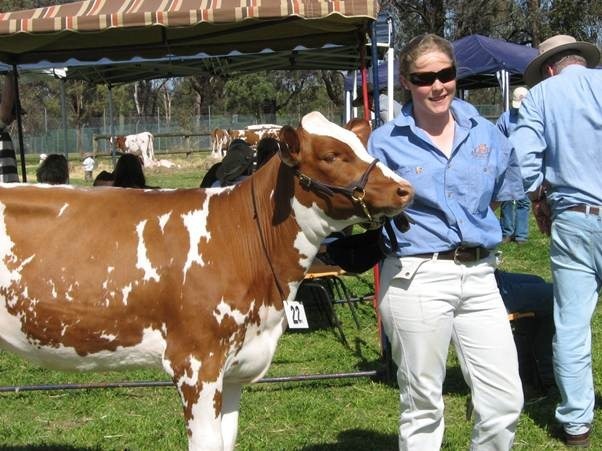 I broke in a heifer, or two, every year and after learning the ropes, in my senior years I ran the group, organising young students, heifers and even the show teams. Those six years of living on a farm alongside a great agricultural education and involvement in the Rural Youth club and the stud Ayrshire cattle team built the foundations for my love and commitment for rural Australian and our agricultural industries. 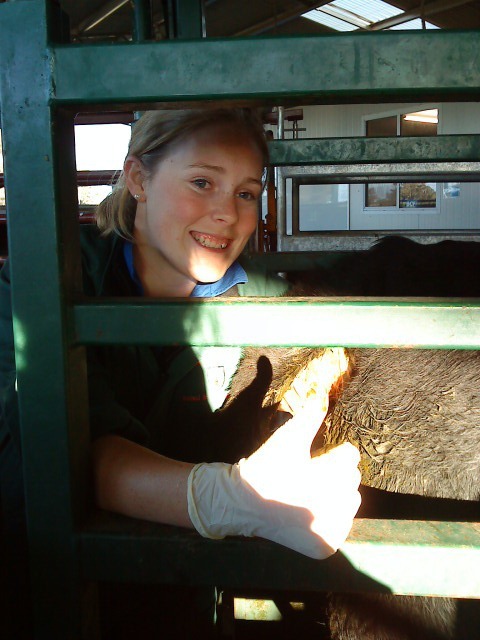 I desperately wanted to become a veterinarian to continue my work with cattle, and ultimately agriculture. After finishing high school I began studying Animal Science after being knocked back from entry into Veterinary Science. I started showing cattle for an Ayrshire stud (Mayfield Farms), and was mentored by my great ‘second family’, Paul and Vicki Timbs. They saw something in me and subsequently helped me every step of the way to gaining experience in the show scene, on the farm and in animal husbandry. These foundations have allowed me to come such a long way. 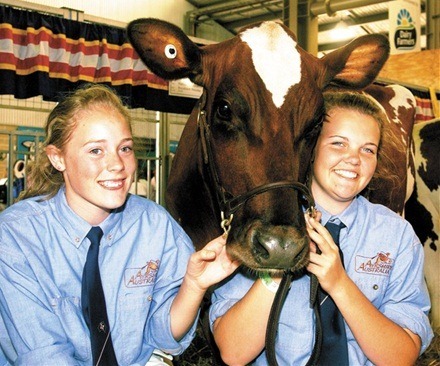 In this time I also started working at the Working Dairy at the Sydney Royal Easter Show. After learning the ropes I graduated to Assistant Manager in 2008 and love every moment of educating the public about where our milk comes from, from looking after the health and wellbeing of the cattle to the harvesting, processing and marketing of milk and its products. Education is something I am extremely passionate about, as I believe we need to form partnerships with consumers so can work together to ensure agriculture has a bright and sustainable future. After a second knock back in 2007, I finally gained entry into Veterinary Science in 2008. I am now in my 5th year of my degree, and graduation just around the corner. 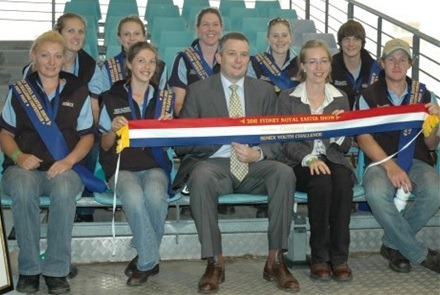 I am a proud member of Ayrshire Australia, the ASC Youth Group, Wagga Wagga Show Society and the RAS of NSW. Representing Wagga in the Sydney Royal Showgirl competition finals in 2011 was a particularly proud moment. I am very happy to tell my friends that I earn my money milking cows (and I am happy to persuade them to have a go at it too!). I am also very happy to stand up for the industry that I have become so passionate about. When I saw the Coles’ video “Our Coles Brand Milk Story”, I was infuriated with the way they had spun the truth and misrepresented the facts. I suppose any dairy farmer or dairy industry employee could tell you this too. I wanted to reply but knew that words, especially to Coles, would get me nowhere and would get to no one. I thought about it for a second- how can I reach the consumers and have an effect? I hope they think about the choices they make if they buy supermarket brand milk, and how it affects others. Ultimately it would be great if more people boycotted generic brands and bought branded milk products instead so we can really combat the problem. I also want shoppers to think about the information they are being fed, especially by such big powerful companies. 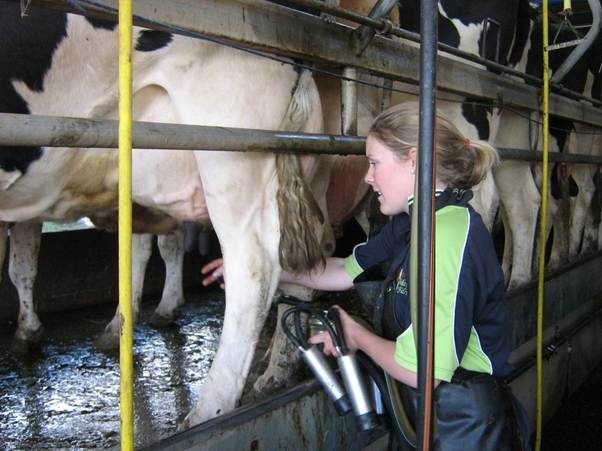 As you can see I am extremely passionate about the dairy industry, its future and the opportunities it can give you. I am a walking talking example of the joy you can get from working in and the doors that it can open for you. I will continue to advocate for this wonderful industry that has made me who I am, so that other people can see the exciting opportunities out there. The dairy industry is full of amazing, talented and supportive people and I want to help make a difference to someone else’s life like the people I have met in the dairy industry have made to mine.